Speeding on to Switzerland – Run. Ride. Roam. Breakfast, sitting at a table, how delightfully civilised! What a lovely reminder of home. 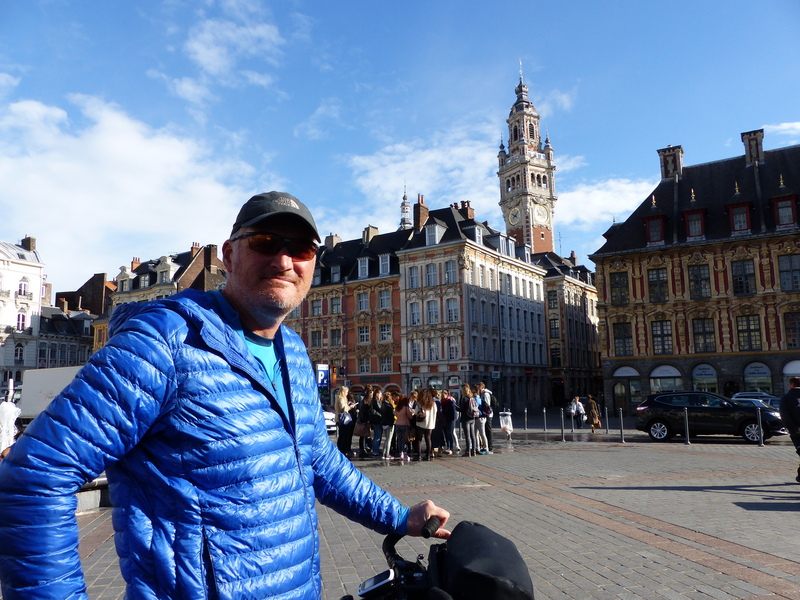 I enjoyed my final moments of homely comforts in our little apartment in Lille, before we packed the bikes and prepared to move on again. 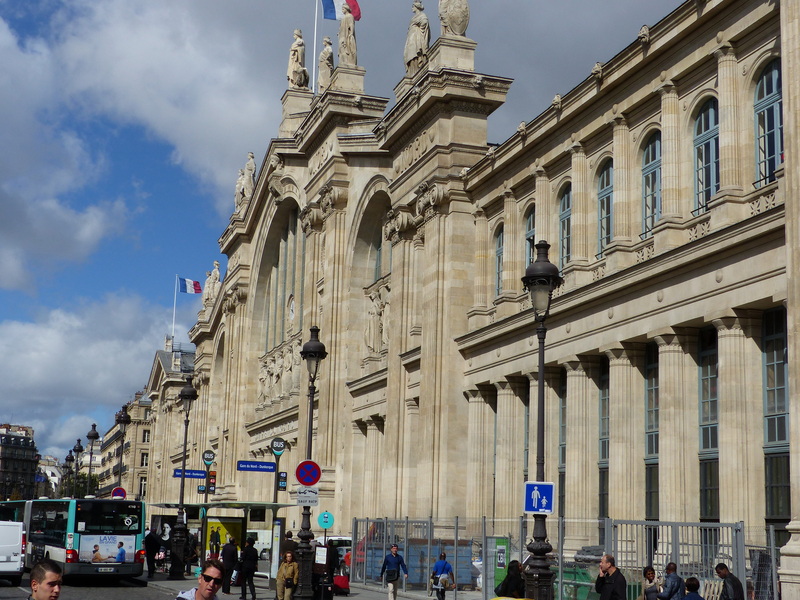 Off we went, for the blustery and chilly pedal into the city centre, to a different train station, where we would await the speeding metal tube that would transport us to Paris. On arriving at the station, the first thing I noticed was the location of the departure hall…down. Oh no, is this going to mean stairs or escalators and trying to hold all the weight of the bike again, while gravity tries to win the tug of war? No, look! An elevator! You little beauty! My bike fitted, no problem, so down I went. Steve had to do his usual trick of balancing his bike on its back wheel like a rearing horse, to fit it in, but eventually we both made it down. Now, what’s this I see? The platforms…down below us. More down! Time for our luck to run out surely. Now there’ll be stairs. A quick reconnaissance around the area and what do we see…another elevator! Surely not, it can’t be this easy! We waited like Stan and Shirley at Wednesday night bingo, looking at the screens and waiting for our number to come up…which platform will we have to race to? Watching…waiting…platform numbers appeared for other departures…still waiting…44…there it was, that’s us, off we go! We headed for the elevator, pressed the button and as it ascended to our level, we see that it’s a double width elevator! Now come on, this is just too much! Now we could fit both the bikes in at the same time, standing on two wheels. Down we went to the platform, power walked the whole length of the train, to the final carriage. Steve jumped on to see what the storage situation was like, while I waited and prepared to start unloading bikes, ready to throw bags on in a hurry, if necessary. No, what did we discover…the bikes were in the rear storage compartment, so they could stand against the wall, with their load intact, in their own little room. Stored. The bikes all comfy in their own little compartment. This is amazing, considering our previous challenges with trains and train stations. We still had to lift the bikes up some steps to get them on the train, but this was no hardship. There was a nice man standing at the top of the steps and when he saw me lifting the bike up, he leapt into action and took the front of the bike and started to help me. “A pleasure Madame,” came his reply. What a lovely man. 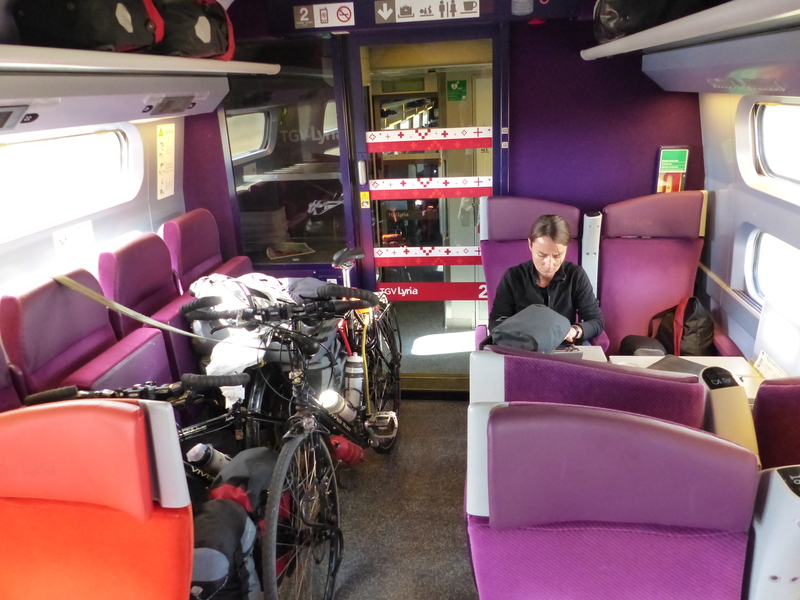 After stowing our steeds, we found our seat and settled in for the one hour trip to Paris where we would catch our connecting train to Geneva. 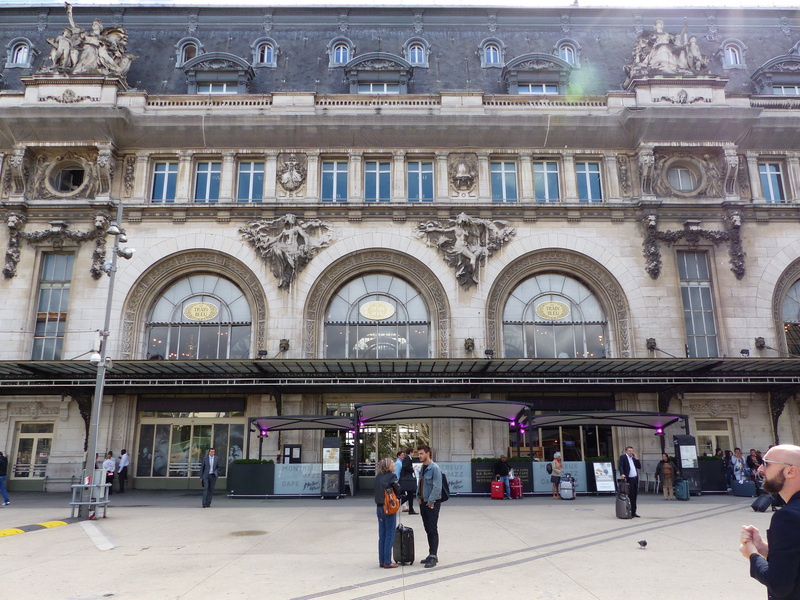 With a slow rock and roll, we arrived at Gare de Nord and again our luck was holding. Our arrival platform was at street level, so we could just wheel the bikes straight out of the station. 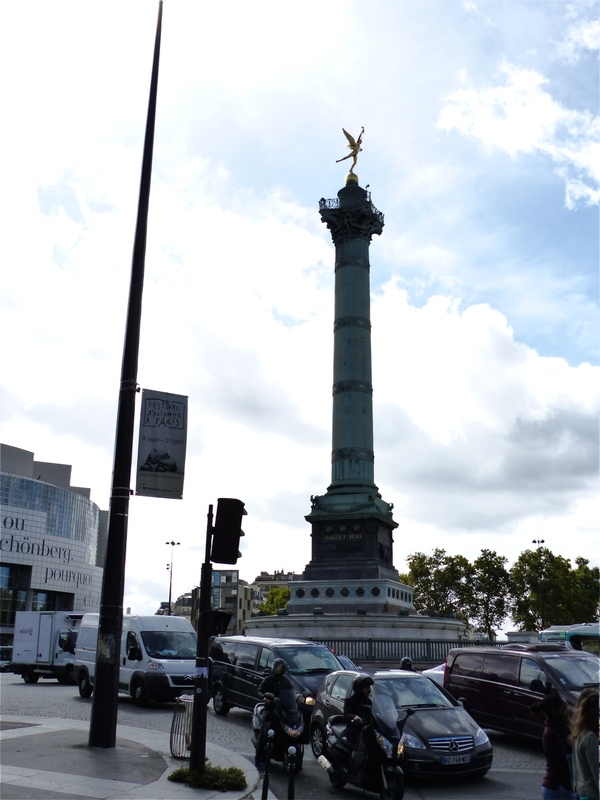 We walked out into the Paris sunshine, looked around at the city we so loved when we were last here and mounted our wheels again for the 5km ride across the city to Gare Lyon, a different train station, to catch our connection. 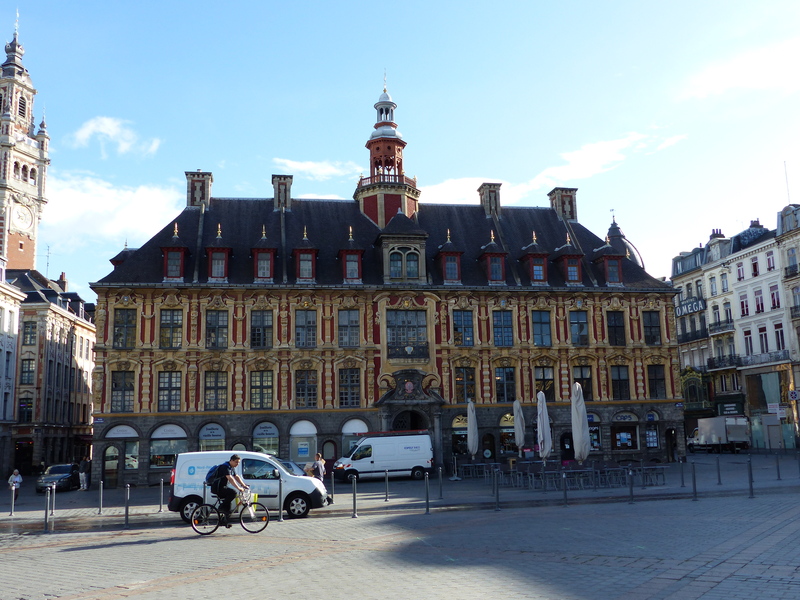 The ride across the city was so much fun, just like our last experiences of riding in Paris. I don’t know why, because the city was loud and busy and hectic, but I still loved it! We rode through the streets, swerved in and out of traffic as we dodged the cars and trucks parked in the bike lanes, then zipped across lanes and raced through intersections, dodged pedestrians and all the while I’m looking around me and grinning. I love Paris! It’s a city that has all the things we usually don’t like about cities, but I just love it. Steve was in the lead, with one eye on the traffic and one eye on the GPS to follow the directions to the station. He did a super job of navigating again and we soon power pedalled up to the front of the station. OK, what’s in store for us at this one? We walked the bikes in and straight away saw our train on the departures screen. What! Surely not! It was leaving from Hall 1, right where we were standing! No need for stairs or escalators or elevators! This is just incredible! We found a seat and waited for our departure time, while having a lunch break. We were again glued to the screens, waiting to see which platform we needed. There it was…Platform C…off we go! We walked the bikes down to the platform where our train was waiting and began walking along the platform to locate our carriage. A rail attendant saw me with the bike and said something that I didn’t understand but gestured to the end of the train, letting me know that’s where the bike carriage was. “Merci,” I said and stepped up the pace. Boy, was that train long! It went on and on and on! We eventually got to the final carriage and did our routine again. I waited in anticipation of a swift unloading procedure, while Steve did a quick reccy on the train to see where the bikes needed to go. What we discovered next was the absolute bees knees! We didn’t have to unload the bikes, we could lift them up the steps again and take them on fully loaded, they had their own space in the carriage where they could lean against the wall, and not only that…our allocated seats were in the same carriage, right beside the bikes…and not only that…no one else got into our carriage. Yep, we had the bikes in the carriage with us and we had the whole carriage to ourselves! This was becoming a five star rail experience! All the difficulties we’ve had in the past and here we were, taking our second train for the day in our third station of the day and we hadn’t had to navigate one set of stairs or unload a bike and then it was capped off with our own private carriage. It was beyond super! All four of us in our own private carriage! We settled in and watched the green farmland, hedges, cottages and cows blur past the window, as we sped towards the Swiss border and our next encounter with a new country. A little over three hours later we rolled into Geneva station. Here comes the test, will our luck hold out? 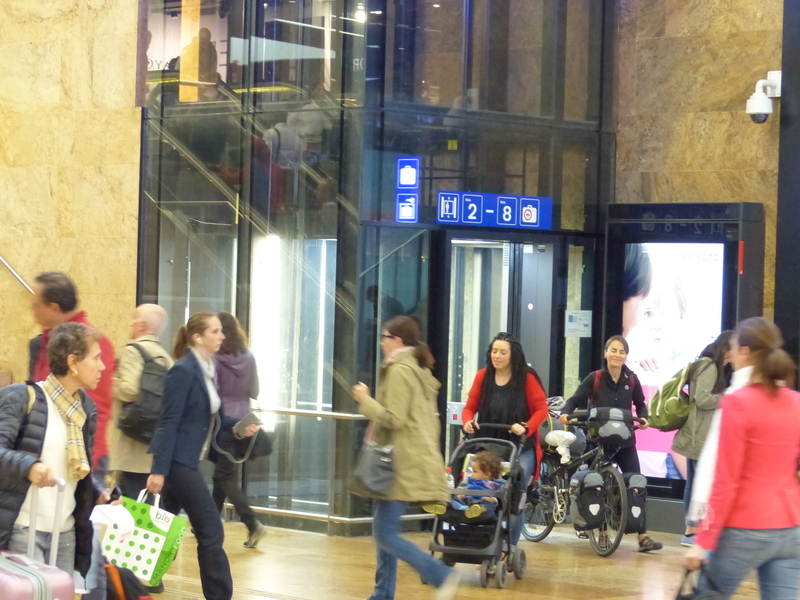 What will we have to navigate in a Swiss train station? We got the bikes off and started walking along the platform. I could see that this platform was up and we would need to go down to get to the street. As we walked towards the exit, I couldn’t believe my eyes…a ramp! Yep, there were stairs but beside them was a ramp! This is too good to be true, the whole day can’t go this smoothly! We wheeled the bikes down the ramp and into the station. Now, just one level to go to get down to the street. I could see the exit doors down below, but in front of me I could see…stairs and escalators. Oh no, here we go, so near and yet so far, it was time to psyche myself up for the battle with gravity. Then, I saw it! Tucked away to the side of the stairs…and elevator! You little ripper! Steve went down the escalator, since his height makes him a better match for gravity than me and I stood and waited for the elevator. Up it came and then down I went. Can you believe it! A whole day of train travel and not a single flight of stairs to tackle or the need to unload the bikes on a platform. That’s a streak of luck we couldn’t have ever imagined! Stoked! Still grinning as I walk out of the elevator. The final hurdle was cleared! We headed outside and the first thing that hit us was the warm air. It was 6:30pm and it was warm. That was a nice change. The other thing that hit us was the cacophony of car horns. We’d arrived at peak hour and whatever the drivers were doing, there were a lot of other drivers who weren’t happy about it! The horns were blaring constantly. We set off into the rapids of traffic to navigate our way to our hotel. I have to say, our introduction to riding in Switzerland was a tad stressful. This wasn’t fun city riding, this was busy and noisy and not enough traffic lights to help get across intersections, so it meant waiting at stop signs, waiting for a break in traffic and then gunning the pedals and going hell for leather across the intersection before the next wave of traffic came along. We did have some bike lanes and we eventually made it and checked into our friendly budget hotel. There was a rack in the underground car park, where we could store the bikes, but when we got there, it was to find a motorbike parked right in front of the bike racks so we couldn’t get in. 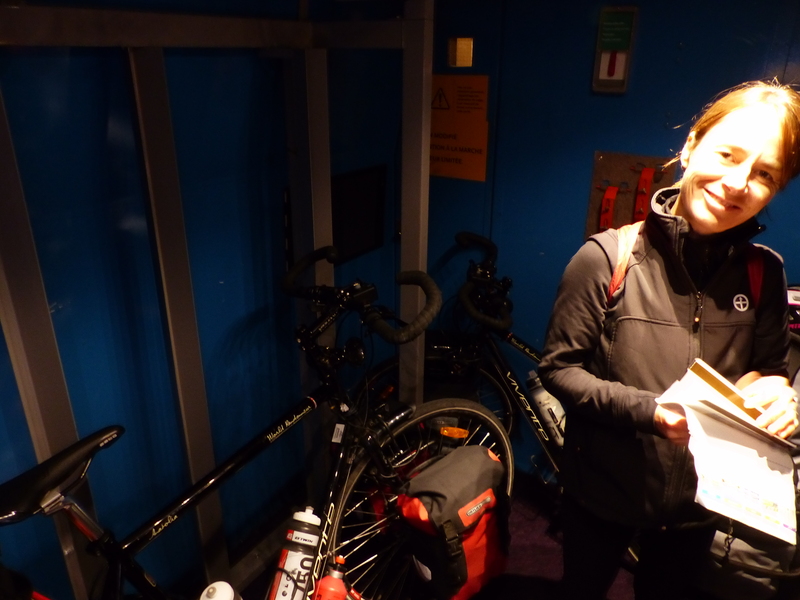 The nice people at reception said we could keep the bikes in our room though, so up another elevator we went and parked the bikes with us. It’s been a long day, but a day full of good luck. My worries and anxieties about a day of train travel were unwarranted and we had a day of travel that was smooth as smooth. I still can’t believe it! We only have one day in Geneva before using it as a springboard on to Italy. 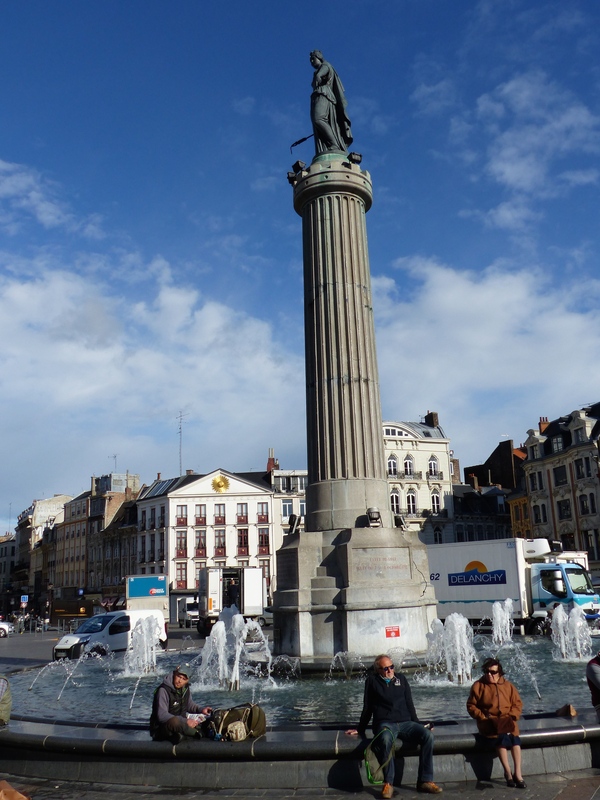 We’ll spend tomorrow exploring, helped by the free public transport pass that our nice budget hotel gave us. Since I’m in Switzerland, I wonder if I’ll see any Heidi references? I’ve already seen one on the hotel menu displayed in the elevator. The children’s option was called the Heidi & Peter Plate! All I need is a mountain and a few goats and I’m right at home! I’ll see what I can find tomorrow as we wander and roam. Yodel-ayee-yodel-ayee-yodel-ay-ee-oooooo!!! !